Photograph by Team GT for Getty Images. What do the clothes we wear when no one is looking reveal about us? If the lobby of loungewear, Dress Sweat, and #robelife brands is to be believed, it is something like our authentic selves. Sleepwear is "a declaration of personal value," according to one purveyor of $278 pyjamas. Self-care, 2017's favorite activist branding opportunity, purports to be about wellness. But it's really about how the aesthetics we pursue in private impact our wellbeing. Do you want to be listening to a meditation podcast while swaddled in cashmere? Or are you content with watching My Lottery Dream Home in a crumb-adorned Snuggie, a cigarette dangerously close? Conceptually, Leonardo DiCaprio belongs to the latter category. Away from red carpets and photo shoots, where he delivers on the movie star promise in perfectly tailored tuxedos, hair flawlessly sculpted, DiCaprio can often be found in a specific place: the streets of Manhattan, on the seat of a Citi Bike, wearing clothing so nondescript that it occasionally fails even to blend. There have been the below-the-knee board shorts on the West Side Highway, sagging to reveal underwear, paired with a vape pen (quoth the Daily Mail: "Looking cool."). There have been espadrilles with athletic socks in Tribeca. There are the T-shirts, always too tight or too loose, and newsboy hats of the dad-embarasses-teen-daughter genre. The 23-year-old model girlfriends don't seem to mind, although they seem to rotate as often as the college sports team whose swag he reps. 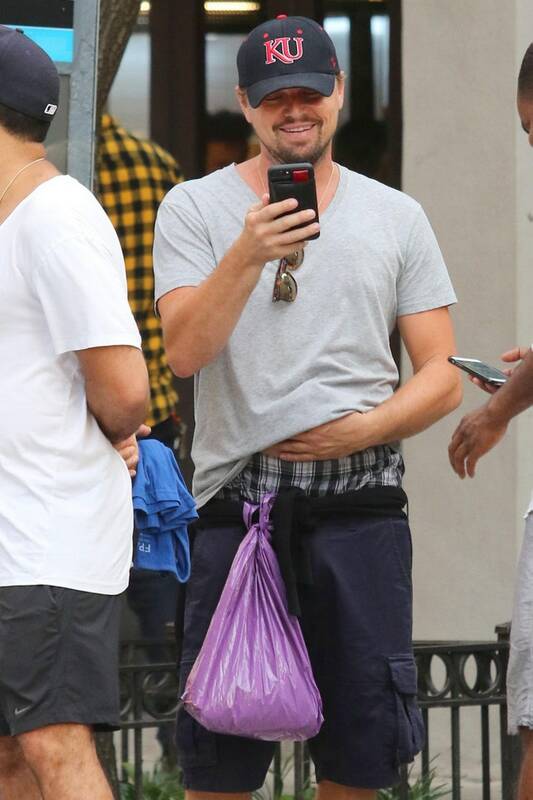 Since at least 2003, DiCaprio has been wearing cargo pants, as immune to their recent resurgence as an ironic fave as he was their initial decline in popularity. Leo and his trusty (eco-efficient) steed. Photography by Team GT for Getty Images. The Citi Bike itself is probably the weirdest part of the equation. Dodging cabs while sweating your way to your destination a thing that, as a celebrity, he could choose to avoid — is not doing so a kind of civilian disguise? Yet the Citi Bike gels with DiCaprio's image as an environmental activist. (He's appeared at Davos and the Paris Climate Talks, acted as a UN Messenger of Peace, and awarded some $80 million in environmental grants, via his foundation). In Paris this month, cycling shorts made a high fashion appearance, on the runways at Off White and Saint Laurent, paired mostly with evening looks. But DiCaprio's bike looks are proudly — deliberately? — utilitarian. He once held a headphone wire in place with his teeth, like a kind of cyborgian bit. This summer, he tied a plastic bag to a belt loop of already-sagging cargo shorts, so he could talk on the phone hands-free. DiCaprio is wearing clothes many of us would be willing to wear in front of no one in front of the whole world. And he knows it, at least on some level, because he is bridled by the paparazzi. Yet as the DailyMail and JustJared articles on cargo shorts pile up, he continues year after year, with remarkable consistency. Which is what makes the blasé-ness of his whole schtick kind of okay. It's a performance of non-performance, from someone whose day job is, literally, to perform. That's an attitude worth considering, the next time you find yourself sitting at home in silk pyjamas, art directing your alone time. Leo is out there making the streets of New York his Snuggie, a place to abandon standards of taste, and perhaps he's happier for it.